The pieces on this album are grounded in accessible tonal language, yet they also explore many harmonies and tone colors. The music is inspired by J. S. Bach and Zoltán Kodály's music for solo cello. “Son-aquifer” is a reservoir of musical ideas in the collective consciousness, resonating through space and time. The music that became Sonaquifer Suite was originally commissioned by cellist Hannah Addario-Berry as part of her project Scordatura, and the piece is dedicated to her. The project celebrated the 100th anniversary of Zoltán Kodály's Sonata for Solo Cello. The section I wrote for Hannah initially was the Flowing-Turning Dance. Kodály's Sonata calls for an unusual tuning: A-D-F#-B, from highest to lowest string, and Hannah requested that the new piece for her utilize the same tuning. By lowering the G and C strings to F# and B, a different resonance is created, and many new possibilities for chords and harmonics appear - ones which are impossibleto play with normal tuning. I became fascinated with the possibilities of this tuning and the piece grew into a suite of four movements that can be played on either viola or cello. Scores are published in both versions. 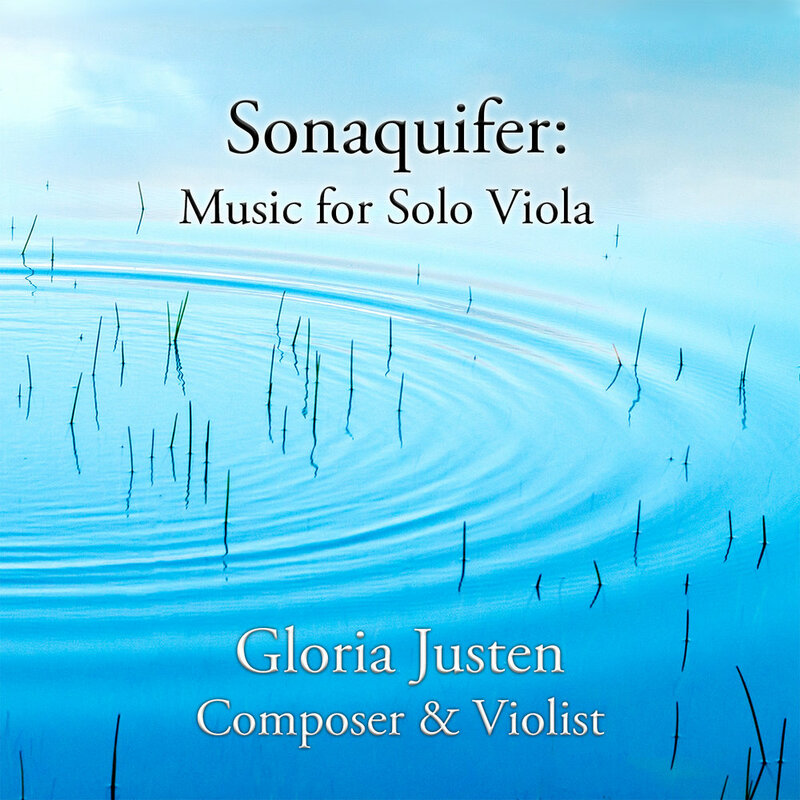 Sonaquifer is a word I invented by combining sonus (Latin for sound) with aqui-fer (Latin for water-carrying) to represent a reservoir of sonic ideas. This Son-aquifer reverberates with musical ideas from all times and places; they exist in a kind of musical Collective Unconscious. I have reached into this archetypal sonic spring and pulled out phrases, chords, rhythms, and patterns. These elements echo music from the past that I know and love. In addition to the influence of Mr. Kodály, I am also indebted for inspiration to my musical grandfather Johann Sebastian Bach, whose music has opened a very deep well of musical possibilities to many generations. The title of the last track, Reflections on the Waves of a Brook, is translated into German as Reflexionen auf den Wellen eines Baches. This name evokes a peaceful water scene as well as making a playful reference to Mr. Bach’s continuing influence on concepts of musical beauty. 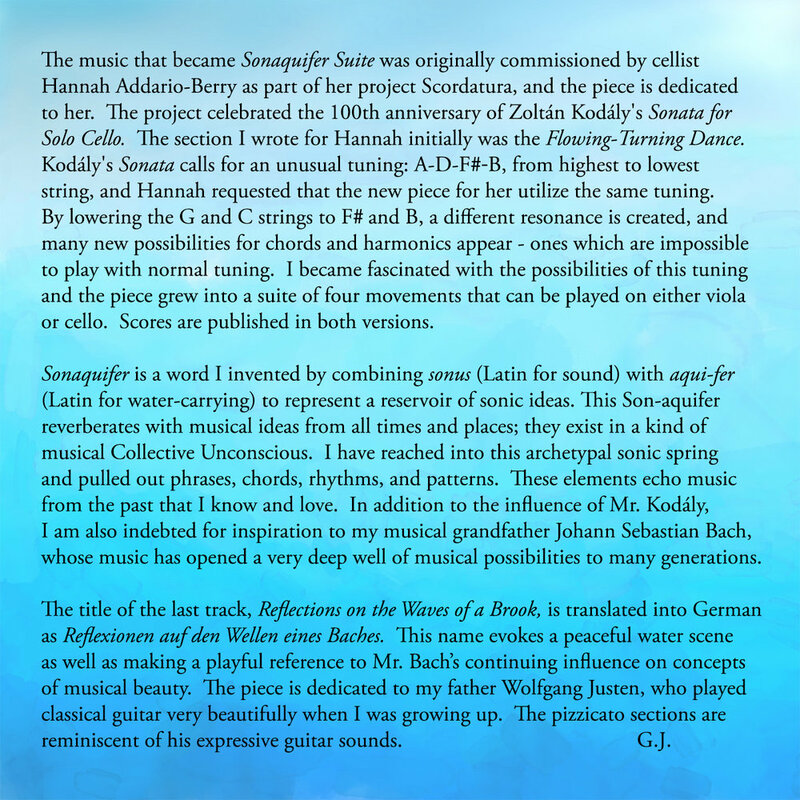 The piece is dedicated to my father Wolfgang Justen, who played classical guitar very beautifully when I was growing up. The pizzicato sections are reminiscent of his expressive guitar sounds. Recorded November 2017 in San Rafael, California. The instrument used to record Sonaquifer Suite was a five-stringed viola tuned E-A-D-F#-B (from highest to lowest string), and for Reflections on the Waves of a Brook I played a viola tuned E-A-D-G, one fourth below a regular viola. The pieces can also be played on conventional instruments.